I know some may be rolling their eyes and thinking not another brownie recipe! True, there are a million and despite the fact that there is probably a brownie recipe in half of the cook books I own I still find myself searching for “the” brownie recipe. You know the one. I like my brownie really dark and “chocolatey”, squidgy in the middle, it mustn’t be too dry, I like a crackly top and I prefer no nuts in mine but to each their own. So you can see I’m as particular about my brownie as Goldilocks was about her porridge! A lackluster brownie is such a disappointment! 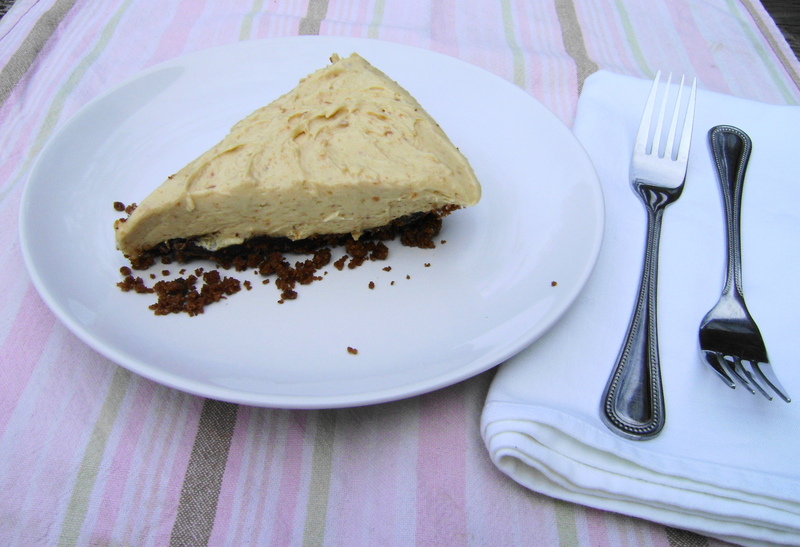 I could go on and on trying out new brownie recipes just in case its “the one” but a couple of years ago I found a recipe in one of my favourite cake books, The Hummingbird Bakery Cookbook. Those brownies were really good, ticking all the right boxes! So that’s the recipe I’ve gone back to, Ive tweaked it a bit over time, adding less sugar than the vast amount in the original recipe. I always use dark chocolate that’s good for eating such as Lindt or Green and Blacks, I’m not a fan of the taste of cooking chocolate. Like the advice to only use wine in cooking that you would drink I believe the same applies to chocolate. In the picture you will notice that my brownies are quite flat, this is not how I prefer them but I used the pan I bought that calls itself a “brownie” pan, which is rectangular. I would recommend using a square pan so the brownies are deeper thus more squidgy in the middle! The inspiration for this post comes from my friend, Lorrie, who has asked me more than once for my brownie recipe! (finally, the recipe Lorrie!) I made her some a long time ago and she remembered them! In fact this is my most asked for recipe! 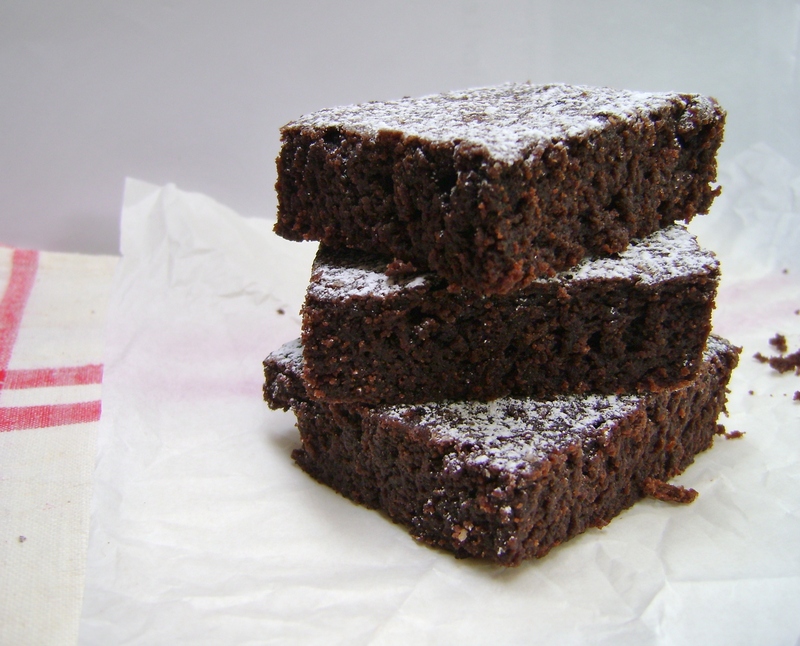 Do you have a favourite brownie recipe? Do let me know, I am quite addicted to brownie recipes! Preheat the oven to 170 c, 325 f, Gas 3. Grease and line with baking paper a brownie pan. 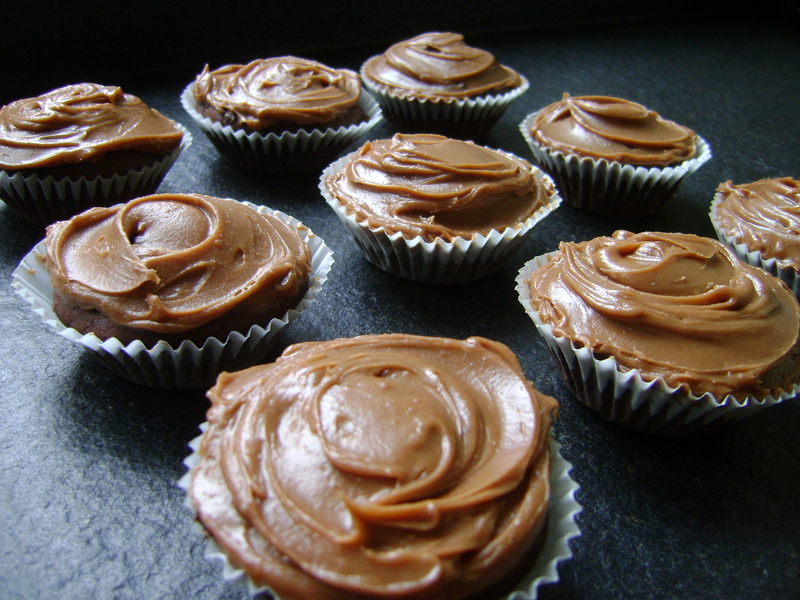 Place the butter and chopped chocolate in a bowl over a pan of simmering water to melt. Stir until combined. Remove from the heat. Add the sugar, vanilla and coffee, stir until combined. Mixture will appear grainy. Mix together the eggs and add to the chocolate mixture in 3 stages stirring well between additions. Pour the mixture into the prepared tin and bake for around 20 – 25 minutes. 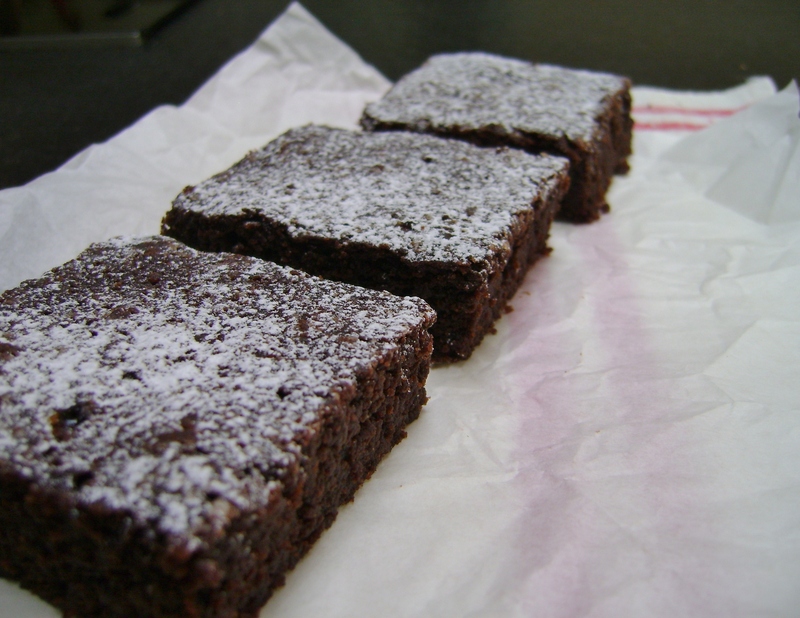 The brownies are cooked when they look cooked on the surface but are still a little soft in the middle. Leave to cool in pan and when completely cooled remove from pan and cut into portions. 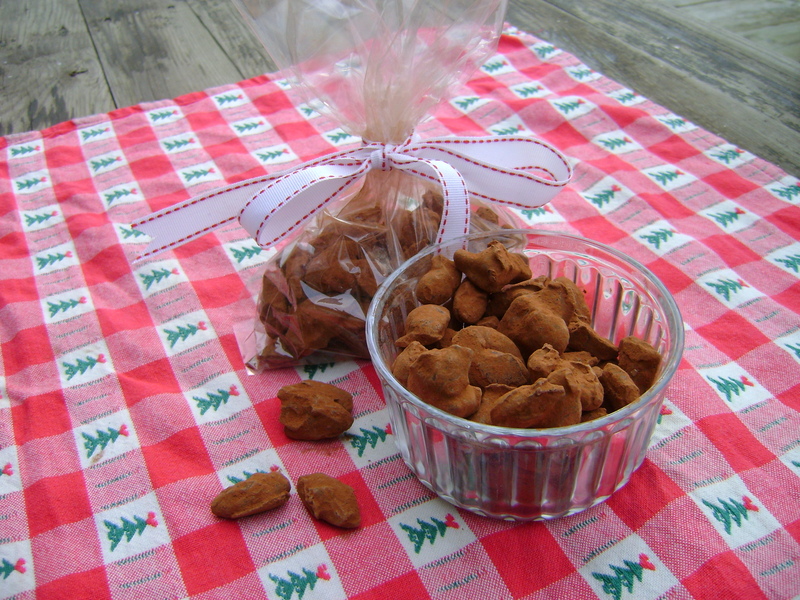 Vanessa Kimbell recently organised another of her spectacular Christmas gift swaps where everyone takes along a homemade food gift and swaps it for a goodie someone else had made. Although I was unfortunately unable to attend. I thought Id share here what Id intended to take along. The theme was chocolate so I’m sure you can appreciate how long it took me to decide what to make. I finally decided Id make chocolate bark, which isn’t commonly seen here. I’m sure people will soon catch on, it’s incredibly easy to make and there are so many options, it is simply melted chocolate topped with your choice of fruit, nuts, biscuits or sweets and makes a lovely treat or gift. Choosing the topping for my chocolate bark was easy. 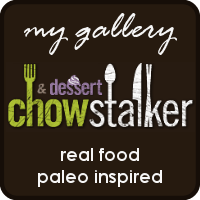 Id recently seen the most beautiful sugared cranberries in this post by my twitter friend, Barb of Creative Culinary. They are so incredibly festive. Id known as soon as I saw then that I would soon be making them! I thought they would make a lovely sparkly topping to some chocolate bark. 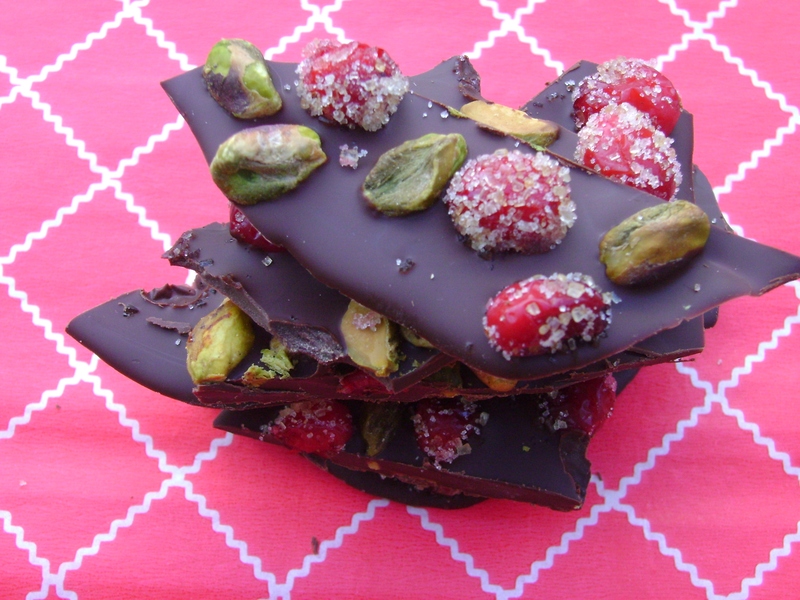 I chose pistachios as another topping as I wanted a nut and thought the green of the pistachio would add a further festive touch to my bark! As the chocolate is the main ingredient use the best quality chocolate you can, it really is worth the extra money, no point if it looks nice but doesn’t taste it! Barb’s recipe calls for sanding sugar, I’ve not come across that here but demerara sugar worked fine for me. This recipe isn’t for a huge amount but if you wanted more it could be doubled. To make the sugared cranberries see here. You could use dried cranberries instead but the sweet/tart burst from the sugared cranberries is so good. If you are making the sugared cranberries do this first so they have time to harden. Roast the pistachios on a baking sheet for around 10 minutes on 200 c, 400 f, gas 6. Remove from oven and allow to cool. Once the toppings are ready begin by cutting a piece of baking paper to the size of a baking sheet. Set the paper aside and put the baking sheet in the freezer, it doesn’t have to be for long if you pop it in before you start it will be cool enough by the time the chocolate is melted. Get the baking sheet from the freezer, put the ready cut baking paper onto the sheet and pour the melted chocolate straight onto the paper, spread the chocolate out into an even layer. Scatter the cranberries and pistachio nuts evenly over the chocolate layer.Put in the fridge to cool and harden which will take around 30 minutes. When the chocolate is hard break into pieces. I like uneven shards of bark so just snapped it randomly. If you prefer a more orderly appearance to your bark slice with a knife. 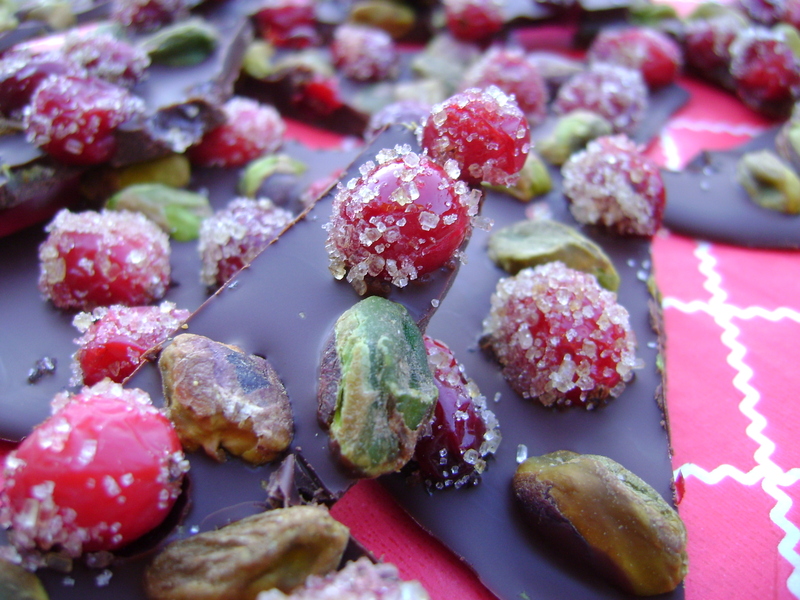 Generally chocolate bark is stored in the fridge but the sugar on the sugared cranberries will melt if kept in the fridge so this bark really needs to be enjoyed fairly quickly after making, which is no problem as its so good! Last Sunday I took part in a baking challenge testing the quality of supermarket products. The ever inspiring Vanessa Kimbell wanted a very good question answered, what exactly is the difference between supermarkets? The price difference we already know can be vast but does this mean when we shop at one of the cheaper supermarkets we are being sold products of an inferior quality or is it actually that we are more cheated by shopping at the pricier supermarket and their products are of no better quality than the cheaper stores? Along with so many others the recession has hit my purse hard and I have found myself swinging between the higher and lower priced supermarkets during the last couple of years so this question was one that I was very interested to have answered! 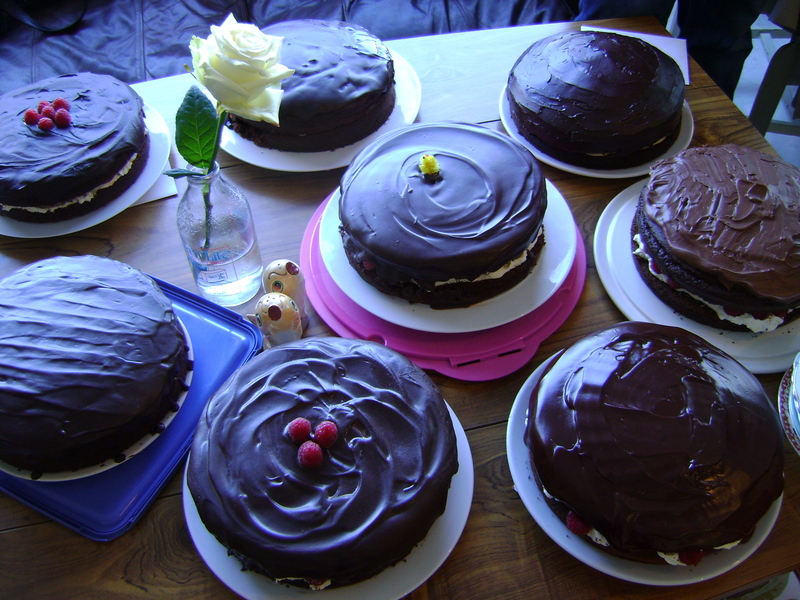 9 bloggers, including myself, took part in The Most Marvelous Chocolate Cake Bake Off each making the same chocolate cake following a recipe from the lovely cookery book Prepped by Vanessa Kimbell using a stand mixer. We had to buy all of the ingredients for the cake from one supermarket each, my supermarket was Aldi. We were to keep the supermarket a secret so as not to influence the judges, especially as one of the judges was William Sitwell, the writer/editor of the Waitrose kitchen magazine! Judging alongside him was Helen Best-Shaw creator of the fabulous blog Fuss Free Flavours. The bake-off was held in a lovely vintage shop/cafe called Most Marvelous in Northampton and broadcast live on the Kitchen Garden radio show that Vanessa is on! I’m glad to say the results were not as predictable as I had expected. The most expensive ingredients did not make the winning cake! In fact the most expensive supermarkets were rejected along with the cheapest. 1st and 2nd places went to Morrisons and The Co-op with Sainsburys coming in at 3rd. So neither the cakes made with the cheapest ingredients or the cakes made with the most expensive ingredients made the final 3! Interesting! I really expected Waitrose or Marks & Spencer to win! Listed below are all of the cake bakers and “their” supermarkets along with the total cake price. The cakes are listed from the highest price through to the lowest. As you can see the difference between the most expensive and cheapest cakes is quite a lot. I had such fun taking part in this bake-off and it was lovely meeting everyone there! Thank you to Vanessa for organising it and Rosie for sorting out the costs. I guess the question of supermarket quality wasnt really definitive. While its true the 3 cheapest supermarkets did not make the top 3, the most expensive 2 didn’t either. 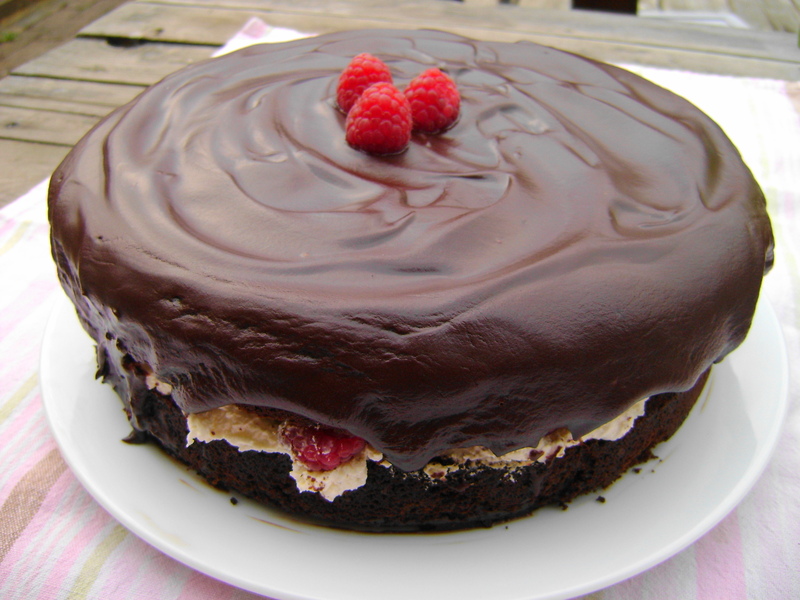 I made the cheapest cake and while its true it was no winner, it was edible! Maybe the answer is to go “middle of the road”. Also choose wisely, seasonally in whichever store your budget allows. Two weeks ago I went to my first book launch! I had such a nice day! 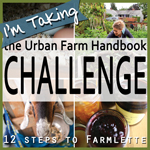 I started my blog when I did a recipe test for Vanessa Kimbell. She was looking for people to test the recipes from her upcoming cook book Prepped! It was the most scary but fun thing Id done for ages! 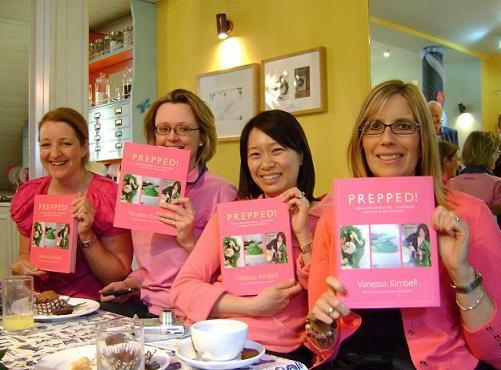 Little did I know I would be lucky enough to test more recipes and then get to go to the Prepped book launch. As a recipe tester I wore pink along with other recipe testers at the launch! It was lovely to meet some of the other recipe testers and so many others. Any nerves I may have had disappeared with each friendly new person I met! There were lots of lovely treats made from Prepped, such as Chocolate Raspberry cake, Victoria Sponge with Cardamom Rose Cream & Rhubarb. There were Cookies, Chocolate, Vanilla & Black pepper Cupcakes and more! It was all delicious, of course I had to try everything, it would have been rude not too! I took some Chili Chocolate Cupcakes to the book launch. The recipe is from the book Prepped, although Id tested some recipes this was the first of many recipes I will be making from my own copy of the book. I must mention how beautiful the Prepped book is. From the beautiful bright pink cover to the gorgeous photos and inspired recipes inside, it really is such a lovely book. Well done to Vanessa! Anyway the cupcakes, they were adventurous for me. Not only is there chili in the cake but also beetroot, neither of which Id used in sweet cooking before. The results were great, the cake is moist and light. I couldn’t detect the beetroot taste that I had expected! The chili leaves a slight warming of the throat after you swallowed the cake, thoroughly pleasing, I thought! 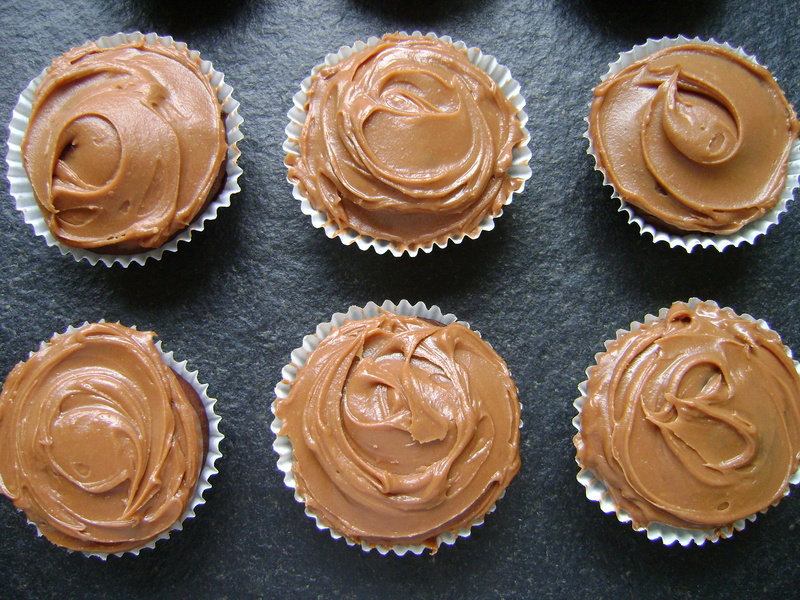 The cupcakes have a chocolate ganache filling, (you can double this recipe and make gorgeous truffles with the other half!). 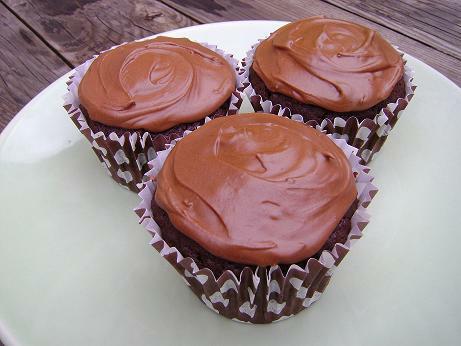 To finish the cupcakes are topped with a smooth chocolate icing. Delicious! I will definitely be experimenting with mixing chili and chocolate again! The recipe for the cupcakes is on Vanessa’s blog www.Prepped.co.uk The recipe on the blog is for a large chocolate cake but use a large cupcake pan and you will get 16 cupcakes.